THE XENA SCROLLS: An Opinionated Episode Guide (307 & 308) | THAT'S ENTERTAINMENT! I featured this two-part episode as numbers 5 & 6 on my list of the 60 best episodes. Read my thoughts on this episode (and the prior) here. 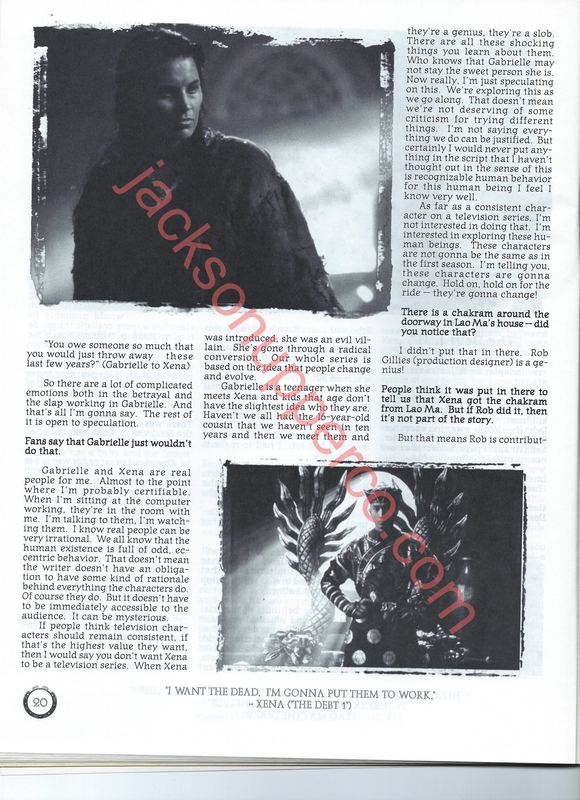 Here is a scan of an interview that writer R.J. Stewart gave on both parts of “The Debt” for The Chakram Newsletter: #2. Check out last week’s post to read more about this legendary two-parter! Gabrielle, Joxer and Autolycus sneak into a palace to thwart an assassination attempt by Joxer’s evil lookalike brother, Jett. The intended victim: Cleopatra. As a Lucy-lite episode, this installment (as with all of the episodes that feature Xena in only the teaser and the final act) is in no danger of ever becoming one of my favorite episodes. And that’s okay — because “The King Of Assassins” has no ambitions to further story arcs or say something powerful about the characters; all it wants to do is entertain. And if you let it, it will do just that. Also, as the first pairing of Joxer and Autolycus, comedy lovers should rejoice in this episode, which gives both men (and the episode was directed by Campbell) the opportunity for great shtick. Additionally, Raimi does double duty as his evil twin brother Jett. Thus, if you are a fan of Joxer, you’re more likely to enjoy this episode. Meanwhile, with Lawless only appearing in four scenes, much of the heavy lifting goes to O’Connor, who does an even better job than she did last season at keeping the story focused and enjoyable. Speaking of enjoyable, Gina Torres is an unbeatable Cleopatra (and I wish she could have been in Season Five’s “Antony And Cleopatra,” but there are several reasons why that would not have worked out), and she imbues the episode with a sense of glamorous excitement. I mean, Cleopatra is a natural Xena fit — if only Xena was around to enjoy it! This is a solid, light-weight Xena episode with new sets, new costumes, new actors, and it’s a lot of fun for fans of Joxer and Autolycus (or Raimi and Campbell). Not a great episode, but certainly an entertaining one.